I just wanted to let you know how our living room/dining room retrofit with radiant under floor heat went. The RetroHeat system has been wonderful. Of course, we are out of the cold season now, but it totally changed the ambiance in our living room/dining room. The floor was warm and the room was warmer and we are so happy we made the investment in doing this. And it is not even our main source of heat, but it has been so inexpensive to operate and makes the living space so comfortable. I want to thank you so much for hanging in there with us thru the design and all the little things that are bound to happen with an installation like this. You were always so quick to get back to me/us, and so helpful in getting the glitches get worked out when they happened. I cannot recommend you, Warmzone and the product too highly. We would do it again in a heartbeat. Thanks so much! Just a quick note to let you all know that the radiant heated concrete steps has performed perfectly. We were able to turn on the system just about 24 hours before Philadelphia received its second largest snowfall on record — 23 inches! And, despite the enormous amount of snowfall, the stairs remained entirely clear. 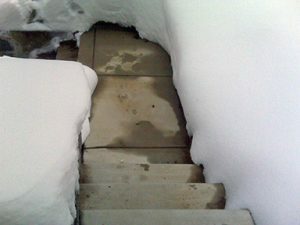 The day after the storm, the stairs were bone dry. I snapped a picture for you, and it is attached. As you can see, it’s kind of amazing that there could be that much snow and nothing on the sidewalk. Thanks to everyone for your contribution to this successful installation. Happy New Year. . .
Hey Bryan and other Warmzone dudes. I just wanted to send you this pic with my system finally installed and, of course, a decent snow. This is what I woke up to. Shoveling is for losers. Haha. I rule. Thanks to everyone at Warmzone for making my life a bit easier. The Driveway Has Been Ice/Snow Free All Winter! This last summer, I installed the heating cables in my driveway. I have a North facing home and the sloped driveway does not see the sun in the winter. This combination creates a slippery condition all winter long. I contracted out the concrete removal and pour. With the help of some friends, neighbors and my wife, we were able to layout all three cables in one day. One friend, helping install the cable, jokingly said “Your daughter won’t slip on ice now, but if she touches the ground she will get burned!” The first snow fall this winter was the test and the heated driveway has been ice/snow free all winter! The option to manually turn on the heat system has not been needed since the sensor works so well. 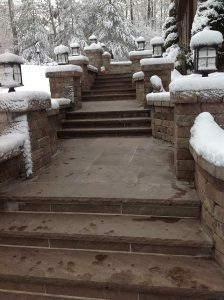 My wife and I are very pleased with the results and feel much safer walking out side during the winter now! Only have a few pictures that I will forward to you. Everything went well. I’m extremely pleased with everything from Warmzone and your help, and your helpers. Thank you again Bryan. 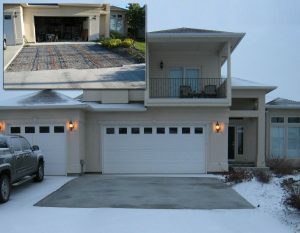 Warmzone did an awesome job with the installation of a heated driveway at our customers house. Nate is incredibly great to work with and we highly recommend you to all our clients. 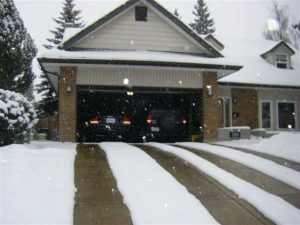 Our customer is extremely happy that he will not have to shovel his driveway this winter thanks to Warmzone. This past weekend, we received over four inches of snow and temps -15 degrees C . . . That’s like Green Bay cold! Anyway, as you can see, the heated driveway is doing its job. Just a week ago, my electrician installed the correct type of wire for the CDP 2 so everything is functional now. A lot of folks in our neighborhood stop by on their walks and have conversations about my driveway, or ask questions if I am outside. I know that some think this would be extremely expensive to operate, but last month, with Christmas lights on every night, I saw only a $150 increase in my electrical bill. Also, we only have 2 or 3 months of significant snow in Calgary so it won’t break the bank, or my back (shoveling) and delivery people don’t have to crawl up the slope in fear of slipping! I would like to express my gratitude towards your organization. First of all my name is Rick M., and I live in Maine. I was doing a kitchen floor remodel and living room floor remodel. My wife and I decided to pull up carpet in living room and tile the kitchen. I decided that from talking to others who have done the same, that they experienced cold floors in winter months. I decided to research “radiant heat“. I was at our local Home Depot store and they were all set in selling me their product. 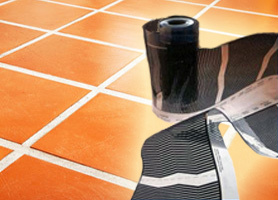 I decided to research out electric radiant floor heating on the internet. Thanks to the Internet I found places that gave me a lot of info.. However, as I filled out your questionnaire at “Warmzone” I was pleasantly surprised at the response I got from Matt. He was extremely pleasant to deal with was extremely knowledgeable of your product, and if he did not know the answer he said so and got the answer I needed. 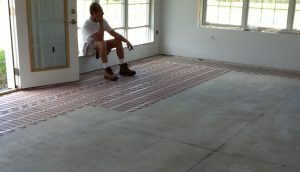 After the purchase of your products (HeatShield floor heating insulation panel and ComfortTile heat cable for under tiles), I started my homeowner installation. I am very handy with my construction abilities. However, I never put in a radiant heat system. In short Matt was able to answer any questions I had come up with (and they were numerous) and keep me rolling along. The hydronic heated floors are working well. It is nice to walk on a warm floor on a cold day. We installed the tubing ourselves. Laying the tubing is a fairly easy task for the do-it-yourself person. I would recommend covering the tubing with 1½-inches of gypcrete. It is nice being able to set the thermostats a few degrees lower than our old forced air system and have the house feel just as warm. All the people at Warmzone were very helpful and knowledgeable and gave us all the time we needed answering our questions we had using the thermostats. We will definitely call Warmzone when we are ready to finish our basement. Thanks for all your help. We hope all of you and your families have a happy holiday season.